It is a good idea to have a copy of the latest home survey for your new property. If one hasn’t been conducted in several years, then it might be a good idea to get one done. Not only do you need to be aware of your property lines but also what is under your property. It’s important to know where gas lines and sewer lines are traveling to avoid accidental breakage from digging. You might discover that your property has already been staked out with iron stakes. Renting a metal detector will help you find those stakes. The older the home the greater the chance of fuses being blown out. You might have upgraded your wiring as part of the move in. If that is the case then you need to familiarize yourself with the breaker panels and make sure every circuit corresponds to the right zone in your home. You definitely don’t want to be flipping every switch whenever a circuit is blown. Did you find out what type of pipes are flowing through your home? If they are galvanized steel, then they are prone to mineral buildup. That can choke off water flow. There may come a time to replace all those galvanized pipes with PVC pipes. If you haven’t done so already, then you should bring in a plumber to get costs for that type of work. Hopefully, the pipes you have will last a while longer. Buying a new home also means buying new furniture. There’s nothing wrong with that but you might not be used to your hallways and doorframes. The cats that would look perfect in your new living room might not even fit to the front door. That’s why you want to not only measure the furniture you’re buying but also the doors and always. If you brought a lot of junk with you from your last home, then it will be a good idea to set up an appointment with Junk King Birmingham. 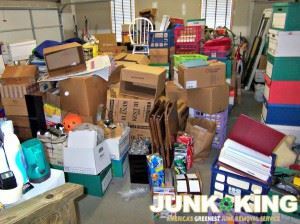 These are the junk removal professionals that make short work out of clearing away all kinds of unwanted clutter. That includes all your old furniture and appliances. Don’t take up valuable space in your new home with old junk. Give it all to Junk King Birmingham today. This entry was posted in Birmingham Junk Removal and tagged homeowner, Junk King, repairs, rubbish on August 31, 2017 by Junk King. Last updated August 31, 2017 .